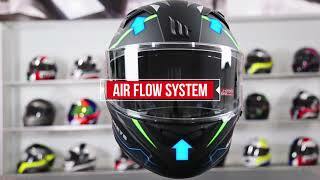 MT Helmets has invested on this new model all the latest technology available on the market: screen with pivoting mechanism, aerodynamic intense study, upgraded linings and optimal air and heat flow. The perfect Helmet, at an affordable price. MT HELMETS has been approved by the most demanding international homologations. DOT CERTIFIED(USA), ECE/ONU 22.05.P (EU) and SNELL USA (USA) cover the most challenging US and European homologation standards. Improved 100% Max Vision Pinlock ready and sun visor.